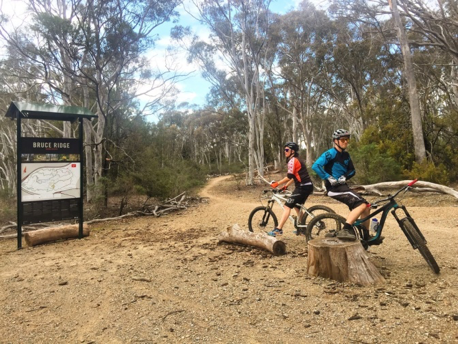 Canberra and Region is a mountain biking hub boasting some of the best trails in Australia, but with so many options available it can be difficult to know where to begin! To help, we’ve put together a suggested itinerary. Enjoy Canberra in autumn - great trails, cool weather and no snakes! 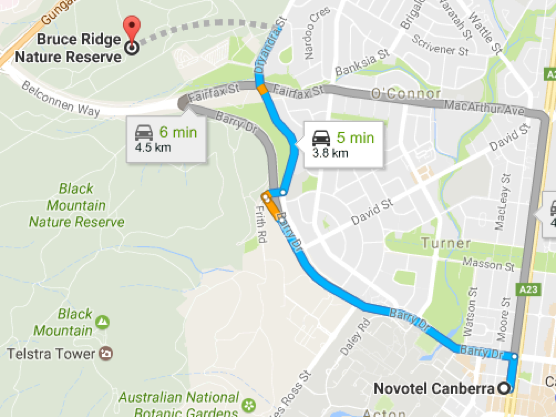 Depending on what time you arrive in Canberra, we recommend wandering around Canberra’s must-visit precinct: the Parliamentary Triangle. There, you can go for a stroll/ride around Lake Burley Griffin and see the impressive Captain Cook memorial jet. At the same time, embrace Australia’s history and culture as you pass the Old Parliament House and Parliament House, and various galleries and museums. Novotel Canberra is great for its central location close to tourist attractions and restaurants. The Cyclery and Cycle Canberra offers delivery and pick-up to central hotels and has a vast range of bikes. For your first afternoon of riding, why not check out the trails Bruce Ridge has on offer. High quality trails in the middle of suburbia - surprising and unique! Only five minutes by car or 15 minutes by bike. Bruce Ridge offers hardpack and loose single track with sections that flow, just watch out for logs! There are some challenging climbs on loose gravel and flowing descents. These tracks are the perfect way to finish off your first day of riding in Canberra. Get up bright and early and head into the woods of Kowen Forest. If you’re still feeling tired you’ll soon wake up with these exhilarating tracks layered within the pines. You can reach Kowen Forest in 30 minutes by car or two hours by bike. The Kowen Forest tracks cater for all levels. You can easily spend two to four hours exploring the forest – for a bit of fun see how many stuffed animals nailed to trees you can spot! The Escalator track in East Kowen Forest is as its name suggests; a steep, uphill trail. The trail is open, dry and rocky, so take care! Although it isn’t too technically challenging, you’ll definitely be out of breath when you reach the top. Connecting to the Escalator is the Effing Track described as ‘effing’ fun, fantastic and beautiful. You’ll find yourself deep in the forest and winding your way around the top of the hill. With moderate climbs and rolling descents this trail is suitable for beginner to intermediate riders. Sparrow Hill contains some amazing rides. Sparrow Hill is just a stone's throw away from Kowen - a 15 minute ride from the Trail Head. Brave riders have been known to enjoy Sparrow Hill's notorious Black Diamond track. Check it out! Start your day at Australia’s premiere mountain bike park. With over 50 kilometres of trails and top facilities this location must be included in your Canberra itinerary. It’s a 20 minute drive or a 55 minute ride. 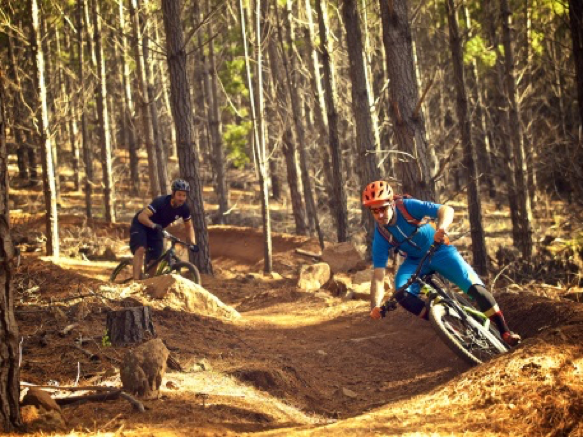 Stromlo Forest has many great trails to get your heart pumping. For example, the Western Wedgetail into Skyline consists of two trails in one descending from the top of the mountain. Although the descents are labelled for beginners they aren’t boring! These trails are some of the fastest you can do at Mount Stromlo. Or, if you love berms, the Luge track is for you. This ride has a series of consecutive berms that will have you grinning from ear to ear! Finally, the Trunk Trail is an enjoyable climb taking you to the top of the mountain with perfect gradients, swooping switchbacks and stunning views. 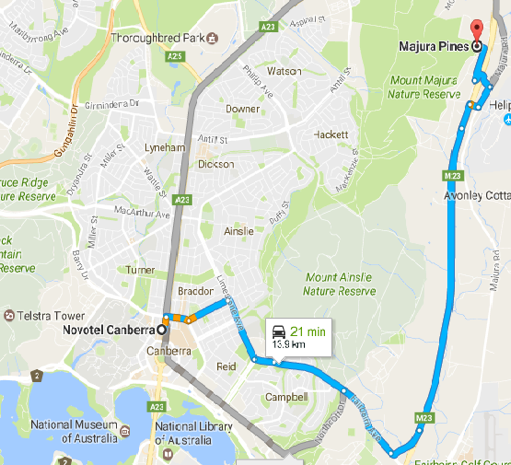 It's time to explore the iconic Majura Pines. Generations of mountain bikers grew up racing on these tracks and with good reason. By car it's 20 minutes or30 minutes by bike. Spend the morning riding these world-class tracks that have produced many champions of the sport. The Rock Lobster is the steepest descent trail starting at the highest accessible point before descending 92 metres. It is recommended for skilled riders. You’ll experience a number ridges, mounds and jumps with the biggest saved until last. Alternatively, deep in the heart of the pines you’ll discover a loop of intermediate level cross country trails. Then it's time to relax and see the sights. Enjoy a late breakfast or lunch at The Cupping Room. This cafe is known for it seriously good coffee, and it’s only a five minute walk from the Novotel. Afterwards, visit the Australian War Memorial which commemorates Australians who have died in war. The museum is interesting, interactive and moving; a must-do when visiting Canberra. That’s a wrap! We hope you enjoy your stay in Canberra. For advice, information, or more assistance building your Canberra mountain biking itinerary, contact CLHQ’s MTB concierge service.